Home > Blog > Turkey: An economy on the verge of collapse? With many firms likely buckling under the strain, there are fears of a possible knock-on effect on the country’s banking sector, particularly if the number of non-performing loans starts to bubble up and international banks grow wary about lending to their Turkish counterparts. Such heightened uncertainty is starting to suppress economic activity. In August, economic sentiment darkened, light vehicle sales plummeted and operating conditions in the manufacturing sector significantly worsened. 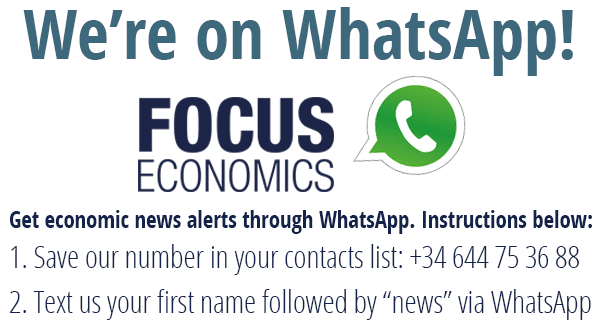 FocusEconomics panelists have taken stock; in the most recent report, they lopped 0.2 and 0.5 percentage points off their 2018 and 2019 GDP growth forecasts respectively. Yet despite the worsening panorama, the Turkish authorities have been largely missing in action over the last month. The Central Bank has yet to make the big-bang rate hike analysts have been pleading for, instead contenting itself with some changes to macroprudential rules and forcing banks to borrow at its higher overnight lending rate. For his part, Finance Minister Berat Albayrak has championed the importance of fiscal prudence, but concrete policy changes are thin on the ground. To help navigate the highly uncertain times ahead and analyze the economic situation in Turkey in more detail, we spoke to Michael Langham, Europe Country Risk Analyst at Fitch Solutions. FE: Do you think the Central Bank’s attempt to raise interest rates by stealth (shifting borrowers to the overnight rate from the one-week repo rate) will be effective in reducing inflation and stabilizing the currency? ML: The CBRT’s stealth hikes will contribute to a sharp slowdown in domestic demand growth over the coming quarters, which will stem demand-side inflationary pressures. However, it will do little to convince investors that the CBRT is a) independent or b) willing to properly address the country’s problems. It’s our base case that the lira will continue to weaken through 2018 but ultimately bottom out as Turkey’s current account deficit narrows, the economy slows and inflationary pressures subside. However, there remains sizeable downsides stemming from Turkey’s large external financing needs and banking sector. Were the currency crisis to spread into crises in either of these areas, the lira could fall quite dramatically and the Central Bank’s stealth hikes would ultimately be seen as inadequate. FE: Do you think Berat Albayrak and the Turkish government are serious about fiscal consolidation? What steps need to be taken to assure investors that this is the case? ML: We believe fiscal policy will be tightened over the coming quarters as the government seeks to reduce inflationary pressures and demands on external financing. I think this forms a key part of the government’s ‘muddle through’ strategy. It needs to be clear that government lending and public-private partnership schemes are being phased out quickly and off-balance sheet assets and liabilities are presented as part of a consolidated government balance sheet. More transparency and a clear outlined planned that investors can follow and see measures being implemented would go a long way to building trust. Whether the government can actual narrow it’s budget may be difficult however. The economy’s sharp slowdown will put increased pressure on the budget and the government may be forced into taking on private sector debt to reduce systemic risks. FE: How do you see the lira evolving going forward? The lira will continue to weaken as investor confidence remains fragile, inflation continues to climb and downside risks remain prevalent. Import demand would fall quickly and the current account deficit would narrow in H218. However, the continued outflow of ‘hot money’ and drop in foreign direct investment (FDI) would add to downside pressures on the lira. Real rates would become increasingly negative and Turkish bond prices would subsequently fall further. We would expect the lira to test its previous low of TRY7.24/USD and could find support at TRY7.50/USD. The lira would ultimately bottom out in 2019, owing to a sharp contraction in external financing needs and a gradual decline in inflation. As the Turkish economy slows, inflationary pressures would fade, increasing real rates and this would eventually prove attractive to investors. The current account deficit is already narrowing due to lira weakness and import demand will likely slump over the coming quarters. The deleveraging process and continued CBRT intervention via unconventional tools could offer further support to the unit and in this scenario we would expect the lira to retreat to the TRY6.00/USD resistance line. FE: How will Turkey’s corporates be affected by the marked currency depreciation? Are their debt loads still manageable? Are we likely to see many defaulting on their debt? ML: Businesses will increasingly see margins squeezed as input prices rise and consumer inflation prices lag producer price growth. Producer price inflation (PPI) rose to 25.0% year-on-year (y-o-y) in June, far above consumer price inflation of 15.9%. This implies producers are facing higher costs, aggravated by lira weakness. They have been slow to pass on rising costs to consumers, with inflation expectations rising at a slower pace. Eventually businesses will feed costs through to consumers but with domestic demand set to slow over the coming quarters and our outlook for external demand to remain somewhat subdued, businesses will be reticent to raise prices and further deter demand. This also dampens the outlook for business investment and further employment growth. Those with high external debts or reliant on imports to sell to a domestic market will be worst affected. Already we’ve seen and heard stories of large Turkish corporates asking their banks for a restructuring of their debt. Instances like this are likely to rise over the coming quarters and we do expect non-performing loans to rise over the coming years. FE: How will the Turkish banking system be affected by the currency depreciation? ML: The banking sector has come under pressure as capital buffers are reduced and liquidity becomes more expensive. If depositors begin to withdraw the holdings en masse and foreign investors envisage capital controls as increasingly possible, the currency crisis could morph into a banking crisis. This would likely require state support for the banking sector and could aggravate the slowdown in credit supply, effectively shutting off borrowing streams for Turkey’s highly leveraged private sector.